story by Ariela Rose | photo by Emily WrenWhether your inspiration is Gatsby’s Daisy and her flapper frocks, the tightly cinched cotillion dresses of the ’50s or a flowing flower-child number, brides seeking upcycled, era-appropriate wedding attire will find dress destiny among Mill Crest Vintage’s collection of 19th- and 20th-century gowns and party dresses. Owner Paula Cooperman has been collecting vintage garments for 35 years, and does much of the scouring herself. 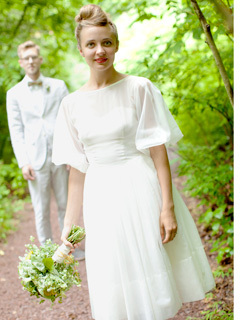 Coopeman’s handpicked inventory is housed in the Lambertville boutique’s bridal salon along with a plethora of vintage accessories—shoes, veils, jewelry and tiaras. Every inch of the 300 square foot salon is lined with dresses; an astonishing sea of lace, ruffles and tulle that threatens to burst forth from tightly-squeezed racks. The selection offers conscious brides a unique chance to select a one-of-a-kind dress and honor their environmental commitments. Repurposing previously worn special-occasion clothes keeps usable apparel out of landfills and has a much smaller impact than ordering a new dress mass-produced in a factory, possibly thousands of miles away. Mill Crest has an on-site vintage costume restoration specialist on hand to make custom alterations, using only vintage fabric, buttons and other materials. The shop also stocks day, evening and prom dresses, as well as suits, outerwear and children’s clothing. Brides interested in perusing the 2,000-piece collection should call ahead to book their private two- to three-hour appointment. Transformation awaits.